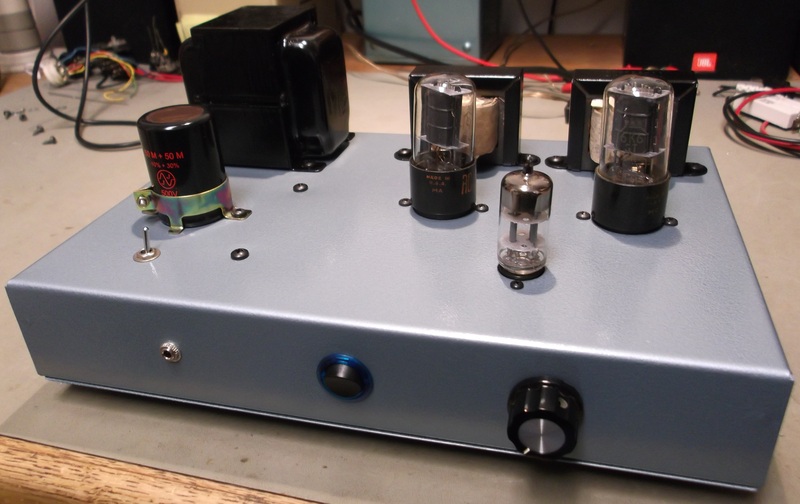 Single Ended 6K6 Amplifier – a Gift! Built for my Mother-In-Law as a Christmas gift! This little amplifier has a headphone jack and volume control up front, speaker terminals in the back, and a power switch with blue LEDs. The color, a light textured metallic blue, is a new color for me and with that blue power switch just looks awesome! She was so impressed with my wife’s darling amplifier (below), that this one was intentionally modeled after it. If I can find a matching pair of 6K6G tubes (you know, the big bottles), those would look really nice in this! The schematic. This is a very similar design to the 6Y6SE I’ve already posted, which was also a made-to-fit-the-parts design. The 12K:8 output transformer has a primary tap but isn’t a distributed load type, just multiple impedances. Connecting the 6K6 this way was just like triode connection, and no loop feedback was needed. It has limited power output but is very nice through headphones, with no hum or noise.